3. David Parker, born Oct. 18, 1796, died Nov 21, 1878 in Mapleton, NC, married Mary Joyner in Hertford Co. NC, they had one child: Mary Figures Parker born June 29, 1829 in Mapleton, NC. Then he married Martha Anna Parker (1809-after 1848). They had six children: Ann Elizabeth, (1833-), Augustine (Tiny) (1835-1884), Benjamin Franklin (1839-), Thomas Meredith (1842-), David Henry (1847-), Jesse Hasty (1848-). Then he married Betty Askew. 4. Wiley S. Parker, born Oct. 11, 1799, he had one child with his first wife (wife’s name unknown): Louis (1818-). Then he married Sarah Ann Parker and they had four children: Mary Thomas (Jan. 12, 1825-), Goerge W. (Oct. 12, 1825-), Sarah (Dec. 26, 1826-), Joseph Franklin (1831-). 9. Mary Rebecca (twin) Parker, born Dec. 13, 1811 and died April 18, 1832 in child birth in Hertford Co. NC, married Robert Battin Cobb on April 1, 1831. Their one child was Mary Ann Rebecca, born on April 18, 1832. She survived birth, even though her mother did not, and had two husbands, living until 1878. First husband was Robert Neverson Joyner. They married in 1852 and had five: Sonora Thomas (1853-1936), Hannah Elizabeth (1854-1863), Robert Neverson (1855-after 1882), Elizabeth Owen (1858-1933), Junius (1860-1862). She then married John S. Monger on Feb 15, 1870. In the 1820 census for Hertford County, the Silas Parker family is listed as containing the following whites: one male under 16, one male under 26, one male over 45, and one female under 45 with nine persons engaged in agriculture. In addition, the following blacks are listed: four males under 16, one male under 26, two males over 45, three females under 16, one female under 45 along with 8 male slaves and 4 females slaves. In the 1820 census he is on the same page as Starkey Sharp and Elisha parker, indicating they were neighbors. Silas Parker is also listed in the 1790 and 1800 Census for Hertford County. 1. Ann Elizabeth Parker, born 1833, died 1885 and is buried at David Parker’s place, married Richard William Griffth on 1850. They had four children: Joseph Thomas (1852-1938), David Aurelieus (1854-1928), Martha Florence (1856-1933), Benjamin Richard (1858-1938). Joseph was born in Mapleton, NC and the others were born in Murfreesboro, NC. 2. Augustine Pauline (Tiny) Parker, born 1835, died 1884 in Lewiston, NC, married William Henry Powell on Nov. 4, 1856 in Mapleton, NC. They had seven children: Eulalia (1858-1938), Jesse Averell (1860-1881), Alberta (1862-1863), David Thomas (1864-1865), Henry (1867-1870), Maude Agnes (1869-1888), Willie Pauline (1871-1949). All were born in Woodville, NC. 3. Benjamin Franklin Parker, born June 19, 1839 and died Feb 22, 1922 in Lewiston, NC and buried there, married Anne Carney Powell (1844-1911) on Feb. 12, 1873 in Woodville, NC. They had three children: Cora Anne (1880-1954), Jesse (1882-1934), Augustine (1886-1853). All were born in Lewiston, NC. 4. Thomas Meredith Parker, born Nov. 30, 1842 and died April 14, 1882 in Mapleton NC and buried there, married Nancy Vann Ely on Dec. 8, 1870 in Como, NC. They had four children: infant daughter, David Lawrence (1873-1953), Eugene Eley (1876-1879), Homer Vann (1878-after 1920). All were born in Mapleton, NC. 5. David Henry Parker, born Oct. 3, 1847 and died Feb. 11, 1918 in Mapleton, NC, first married Lavinia Cecelina Lafayette Sears (1850-1879) on Dec. 22, 1868 in Hertford Co. They had four children: Aurora Floyd (1869-1938), Lucius Belver (1876), May Estelle (1876-1862), Henry Stanley (1878-1954), all born in Hertford Co. Then he married Marcia Shields Sumner (1863-1932) on June 3, 1890 in Hertford Co. They had three children: David Henry (1896), Rachel (1897-after 1930), Audrey Sumner. All were born in Hertford Co.
6. Jessie Hasty Parker, born 1848 and died 1903 in Mapleton, NC, married Ellen Rawls. They had eight children: Grace (1878-1902), Floyd Jesse (1880-after 1910), Clyde Leslie (1882-1950), Eugene Lee (1885-), Pauline Elzar (1887-), Annie Rawls (1889-), Jesse Hasty (1891-), Alice Katherine (1895-). All were born in Mapleton, NC. 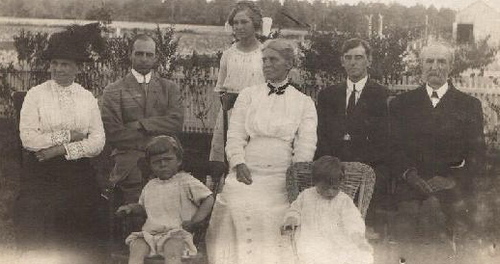 David then married Betty Askew in Hertford, NC and they had no children. This post begins a series on the Parker family genealogy. Augustine Pauline (Tiny) Parker was born in 1835 in Mapleton, NC and died Nov. 6, 1884 in Lewiston, NC. She married William Henry Powell on Nov.4, 1856 – (see above for more on their life together). The next posts provides the story of her father, David. I will follow his post with more Parker ancesters going back to Thomas Parker (1705 - 1773). Francis Parker is the source of much of the early Parker information: The Court House in Jackson, Northampton County, NC was destroyed twice by fire, once in 1832, and again in 1862 during the Civil War. This destruction makes the work on Northampton County families extremely difficult, and having to rely on family bibles and personal papers and letters. This makes Frances Parker's work so invaluable. She started working and doing interviews in the 1940's. Frances started her work on the Parker Family after World War II, and printed her first publication in 1950. She was president of the California Genealogical Association, and held many other positions of import. She did many door to door interviews in Northampton County. I am beginning to hear from a number of interesting people since I started this blog. I recently heard from Barbara Kukla about Parker David Robbins. His first wife, who came from Winton, was Elizabeth Collins, John Bembry Collins’ sister. She saw on this blog that Robbins preceded Henry Clay Sharp as postmaster of Harrellsville. According to family lore, Elizabeth Collins was on Admiral David Farragut's ship during the Battle of New Orleans in 1862, presumably because Parker David Robbins was on it. According to her records, they married in 1859 and parted in 1874. She is writing a book, which will be out in June, titled Sounds of Music: The Dolores Collins Benjamin Story. It is about her friend Dolores Collins Benjamin who is 94 years old and lives at the Ashbrook Nursing Home in Scotch Plains, NJ. Dolores is a member of the Virginia State College Class of 1934. She is the founder of the North Jersey Philharmonic Glee Club, an all-male group that is the oldest African-American arts group in New Jersey. The glee clubs was founded in her living room in Newark, NJ in 1939. Dolores is the daughter of Martin Luther Collins and Mamie Dulcie Reynolds from Winton, NC. Both her father and her aunt, Addie Collins Weaver, taught at the Water Normal Institute in Winton. Dolores was born and raised in the Berkely section of Norfolk, Va., where her parents moved shortly after their marriage in 1909. Dolores' mother's cousin, Alice Nickens Jones, who lives at Ahoskie House in Ahoskie, NC turned 103 years old on April 14. Dolores’ paternal uncle, John Frances Collins, was the valedictorian of the Howard Law School Class of 1905 and a founder of the now-defunct Freylinghuysen Law School in Washington, D.C. Dolores's husband was Joe Benjamin, copyist and bassist for Duke Ellington for 25 years. Joe also played for Sarah Vaughan, Dave Brubeck, and Gerry Mulligan and backed other singers including Carmen McRae and Billie Holiday. These are all some of my favorite jazz artists. I have seen Gerry and Dave live and have Cds from all of these artists. This is a short food break. Recently, when on a trip to an Ives family reunion, I went hiking in the Smoky Mountains with my daughter, Sarah, before going to the family reunion in South Carolina. We stayed on the North Carolina side of the Smokies in Maggie Valley, a much more low key alternative to the excesses on the Tennessee side at Gatlinburg. This is a bit west of the area where most of the Sharps lived but very much worth going to. Maggie Valley, North Carolina, in contrast to Gatlinburg, seems a bit more authentic. It has a large number of old style blue grass dance halls. We played minature golf at a place with actual wood railings and no plastic waterfalls. We were also excited to find Butts on the Creek as one of several BBQ places. It resides on Johnson Creek with a screened in porch alongside the river. They cook with hardwood and produce some good cue. Butts is located at 1584 Soco Road (Highway 19) in Maggie Valley, NC 28751 (828.926.7885). The next morning we had breakfast at the Blue Grass Café. I had eggs, excellent country ham, and biscuits with sausage gravy. There was enough cholesterol to last a life time but an 8 mile hike in the mountains perhaps countered this a bit. I also found a nice site, North Carolina Pulled Pork Barbecue Joints – Lexington Collection, which offers what seem to be independent reviews of BBQ joints in North Carolina, the home of my favorite styles. Here is a link to a broader review on the topic, Barbeque of the Carolinas: East and West, North and South. The web is changing dramatically. No longer simply a source of information provided by organizations, it has become a rich space where millions of individuals participate, provide content, and exchange ideas through blogs, wikis, community sites, and other emerging means. And it not limited to text. Pictures get exchanged through Flickr, video through YouTube, audio through iTunes, and these are only a few examples. The combination of accessibility, transparency, and archiving that the new interactive web provides can also open new opportunities for genealogists to connect and exchange research. There are many aspects of Web 2.0. Blogs are one of the tools it offers and there are many new genealogy blogs. Other useful tools are wikis for the collective development of content and social booking marking sites like del.icio.us and Connotea for saving and sharing links to key sites. I will be writing more on Web 2.0 and genealogy. PLOG – the Pytlewski family blog has provided some useful posts on using web 2.0 for genealogy. Here are some thoughts on geospatial visualization of genealogy data using palatial, ways to preserve photos for the web, and some new ways Genealogy 2.0 can be used for genealogical research. Jessie Powell’s parents were Willie Powell and Celia Averell according to Henry Clay Sharp’s notes. There is also a Jesse Powell is listed in the 1790, 1800, 1810, and 1820 North Carolina census. In the 1820 census a Jesse Powell family is listed as containing the following: two males under 10, one male under 16, one male over 45, two females under 10, one female under 16, two females under 26, and one female under 45 with eight persons engaged in agriculture and 18 slaves. However, there were several other Jesse Powells in Bertie County at the time including a Jesse Powell born in 1772 in Bertie Co. who “was probably the famous preacher of his day, in this area.” He died in 1860 and is “buried close to the huge magnolia tree in cemetery on Lawrence family home place on Thirteen Bridges Road, between Enfield and Scotland Neck, Dawson Crossroads, Halifax County, North Carolina.” This Jessie Powell, the preacher, is known to be likely connected to Eulalia Powell. Jessie A. Powell was born about 1790. The A is likely for Averell, his mother’s maiden name. He married Elizabeth Lee. Family tradition mentions she is related to Robert E. Lee. Elizabeth was born about 1795 and died in February 1878. Jessie died about 1864. Jessie and Elizabeth had seven children according to the notes of Henry Clay Sharp. 1. Solomon was born about 1824 and died in the 1890s. He married Eliza Greene and they had three children: Mary (1850-), John (1852-after 1907), Addie (1855-). 2. Anne was born on Sept. 1, 1829 and died in 1910. She married James Taylor (1822-1866) and they had four children: Ella (1850-190? ), Luthor (1852-after 1907), Ada (1856-188? ), Lizzie (1862-after 1907). 4. James M. was born on Sept. 19, 1834 and died on July 17, 1910. He married Miss Hancock (1847-1907). They had eight children. Thomas (1869-), Eli (1871-), Maude (1888-), and others. 5. Fannie was born in 1837 and died after 1900. She married John R. Powell (1835-1909). They had six children: William, Rosa (1863-after 1907), John (1865-after 1907), Julian (186?-after 1907), Paul (187?-after 1907), Fannie (1880-after 1907). 6. unknown was born 1840 and died with a few years. 7. Mary E. was born in 1842 and died on Feb. 10, 1910. She married James Sharp (1842-1903) and they at least one child. James was the brother of Charles Sharp, Eulalia Powell’s first husband. 1. Eulalia Powell, born May 30, 1858 and died 1938 in Harrellsville, NC. (see above). 2. Jessie Averell Powell, born Feb 15, 1860, died Sept. 17, 1881 in Woodville and is buried there. He is listed in the 1880 Census as a 20 year old single farmer with his widowed 44 yr. old mother as the head of household. 3. Alberta Powell, born Feb, 3, 1862, died Sept. 13, 1863 in Woodville and is buried there. 4. David Thomas Powell, born Jan. 1, 1864, died in June 1865 in Woodville and is buried there. 5. Henry Powell, born Mar. 26, 1867 and died Aug. 13, 1870 in Woodville and is buried there. 6. Maude Agnes Powell, born April 13, 1869, died July, 1888 in Aulander, NC and is buried in the Deans Cemetery in Aulander. She married Mike Dean in Feb. 1888 in Woodville, NC. 7. Willie Pauline Powell, born July 1, 1871 and died Nov. 23, 1949 in Harrellsville, NC. He is buried in the Cullens Cemetery in Harrellsville. She married William Edward Cullens (1861-1960) on Dec. 19, 1889 in Woodville, NC. They had two children: Ethel Lee (1890-1960), Sarah Augustine (1984-). Both were born in Harrellsville, NC.